In July 2015, I had just moved to a new studio apartment in the Rosslyn neighborhood of Arlington. I fell in love with it the moment I saw it. However, the one thing missing from my adorable little home was a pool. Unlike the apartment I had just moved from, my new home lacked this crucial amenity for surviving DC summers. The first weekend in my new home, during which I would otherwise be spending the 95-degree day laying out by the pool with snacks and a book, I felt a little stuck without a place to go. I don’t like to waste gorgeous summer days cooped up indoors, but it was too hot to do anything that didn’t involve water. I don’t remember how I heard about the boathouse in DC, and I don’t quite remember what compelled me to look into checking it out. 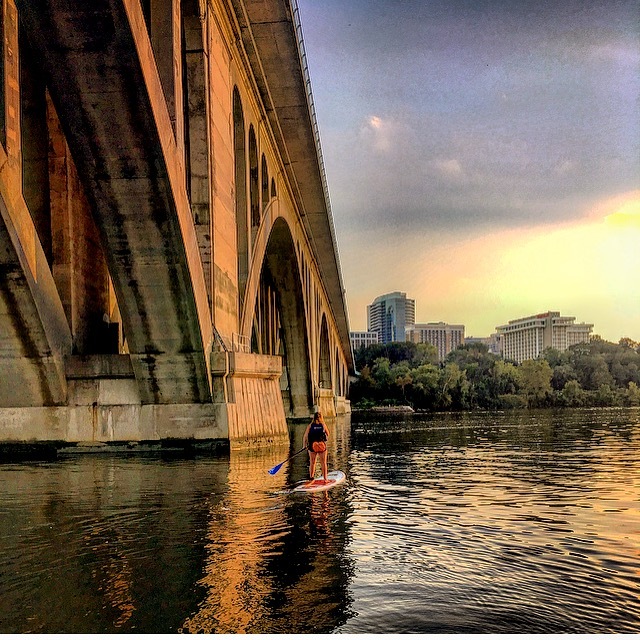 Somehow, I ended up on the website of the Key Bridge Boathouse and I discovered that they offered something I had always wanted to try: stand-up paddle-boarding. It had been on my bucket list for the longest time, preferably to learn in a place like Tahiti or Hawaii. But I decided that I couldn’t wait for Hawaii or Tahiti to come along: the time to try it was now. To be honest, I was intimidated– I’d never gone boating that much, although I loved canoeing the one time in my life that I tried it. 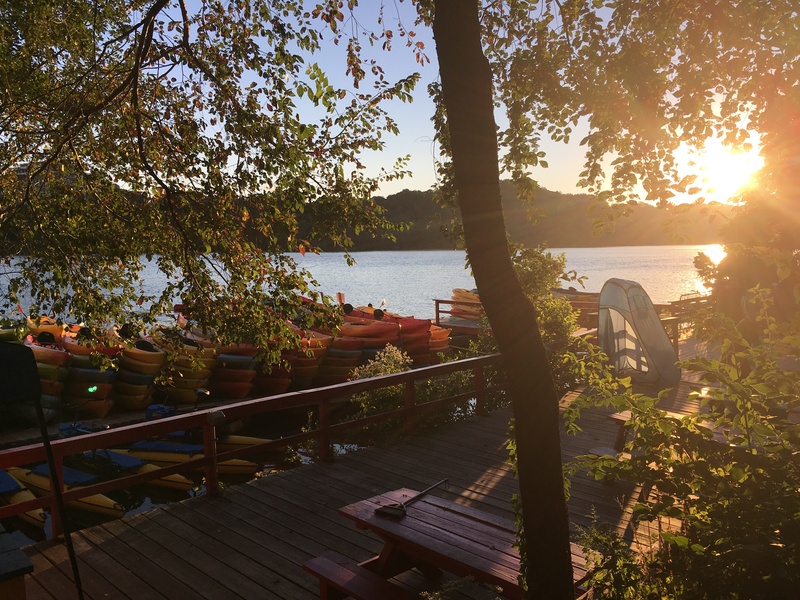 I saw that the boathouse offered classes and luckily, there was an opening for their hour-long SUP 101 class— and it was that weekend! I signed up without a second thought. SUP is an incredibly fun and versatile sport, and it’s not as hard as its reputation precedes it to be. While paddle-boarding is incredibly easy to learn, I recommend taking a class or at least learning some of the basics of the board first through YouTube channels or something. It doesn’t have to be anything formal, really. My class at the boathouse was taught by two SUP-certified instructors and it was immensely helpful to at least have a few pointers on how not to look like an idiot. In this class, I learned how to hold the paddle, how to stop, turn around, and of course how to stand up and keep my feet in position to best balance my weight on the board. Yes, there is a wrong way to do all of those things. Here’s a good overview of the most basic SUP techniques if, say, you find yourself on vacation and want to seize the day. My biggest tip: don’t look down at the water when you’re paddling. Instead, think like Captain Morgan or Captain Jack Sparrow and look confidently in the direction you are heading. Your balance will just happen naturally and you won’t have to think much about it. Besides, paddle-boards are generally constructed to be very sturdy and they can handle a bit of a pitch. If you have the correct footing, a confident nose-to-toes stroke, and have a general ability to hold your balance, you can absolutely manage to have a fun and worthwhile paddle-boarding experience. Besides, even if you do fall in, it’s just water. Your clothes will get wet and then dry off in the sun and breeze. Embrace it! Since becoming an avid stand-up paddle-boarder, I have only seen major benefits as a runner. After taking my SUP 101 class, I bought a season pass to the Key Bridge Boathouse and I have probably spent a cumulative couple of months of my life on a paddle-board by now. The physical benefits of incorporating a water sport in with my marathon-training include increased balance, core strength and engagement, toned arms, and a stronger back. Mentally and emotionally, I am happier and I feel stronger and braver having tried something new that I could love as much (if not more) than I love running. I literally don’t know what I am going to do when the boathouse closes for the season because of how much this sport has enriched my life. It’s a versatile form of cross-training, balance, and strength work. Did you know that 5 minutes of water activity is the equivalent of 15 minutes of land activity? A shout-out to my physical therapist for that knowledge bomb. Just the act of getting on a paddle-board requires your body to adjust to the subtle fluid motion of water, even as you don’t know it’s happening. You’ll notice it when you first get on a board, how your core engages to keep you in balance. Also, the motion of moving a paddle-board forward on the surface of the water by using a paddle is water resistance. Water resistance is enormously beneficial for building strength, increasing muscle tone, and burning calories. In addition, if you want to try a new way to work out, a paddle-board offers so much versatility for cardio and strength! It’s also low-impact, so that makes it easier for anyone with injury or arthritis to try it out. Speed Drills: Pick out a point of reference and paddle as fast as you can to it, then turn around and go back. Time yourself using a stopwatch and set time goals for yourself. Squats: Making sure you keep your squat form intact, perform a series of squats on a paddle-board. You can incorporate your paddle by holding it straight in front of you with your arms extended, then lifting it over head as you squat. Dead-Lifts: Use your paddle to perform dead lifts while balancing on the board. Remember to keep your form in check. Push-Ups and Planks: Self-explanatory, but adding an unstable surface to balance on can work wonders on your core. Make sure to keep proper form on both. Yoga: I can’t tell you what to do, yoga-wise, on a paddle-board. But there is a reason why SUP Yoga classes are becoming so popular. I haven’t taken a class yet, but go ahead and try your favorite yoga position on a paddle-board. 2. It’s a fantastic core workout. If you’ve never gone paddle-boarding before, it’s easy to think that your arms are what helps propel you through the water. Not true. Good paddle-boarding technique and the endurance to paddle for a long time comes from your core. In fact, if you use your arms to paddle, you’re going to tire out quickly. Using just your chest and back muscles may also cause some strain. While arms are part of the equation definitely, the muscles used in paddle-boarding include your abdominals, quads, calves, shoulders, chest, and nearly all major muscle groups down your back including lats, lower back, and glutes. All of those muscles play a role in a runner’s forward propulsion and help keep us steady and in balance with each step. They may be used differently on land and on water, but core muscles keep us moving forward as runners and as paddlers. 3. Stand-up paddle-boarding has a low cost-per-use ratio. Obviously, with running, it’s recommended that you should get a good pair of running shoes and replace them frequently to prevent injuries. That’s where running gets expensive. You also need running clothes, preferably ones that wick away moisture and keep you cool on hot days and warm on cold days. While you don’t “need” all of those things to run, they enhance your running experience and sometimes capability. But shoes break down, clothes wear out, GPS watches crash and never wake up. Everything with running, it seems, has a relatively high cost-per-use ratio. Paddle-boarding, however, is a relatively low-cost option sport in terms of your main piece of equipment. For my local boathouse, a season pass with the unlimited rental option was a couple hundred dollars, but given how often I go, without it, I would be out thousands and may as well buy my own board. If you are new to this sport, you should absolutely rent before you buy a board as they can range from $300 and and up over $1,500 or more. You also have the option of starting out with a board specifically designed for recreational use and upgrading from there. It’s like buying a bicycle, the only difference being that you don’t have to fix your paddle-board as often as you do a bicycle. Unless you take your paddle-board surfing down a minimum maintenance country road, you likely won’t need to replace or repair it very often. With the proper storage and transportation techniques, a paddle-board should last years. Also, if you’re like me and don’t have much room to store a paddle-board, they make inflatable ones out of military-grade PVC that are supposedly as durable as non-inflatable boards. Inflatable boards are a little less expensive than non-inflatable boards, too. What a relief on the runner’s wallet! If you want to buy a paddle-board, make sure you call a boating facility or surf shop and ask a boating professional for advice on what length and size to get for your weight and height. Also, when purchasing a board, be sure to learn about how to care for your board when you’re not using it. If the costs of a paddle-board are overwhelming, the end of summer is a perfect time to score deals on gently used equipment at the local boathouse or surf shop, too. You can also ask anywhere that rents paddle-boards if they plan to offload some of their inventory to make room for upgrades. It never hurts. Life jacket or PFD: If you rent a board, most places offer life jackets. However, if you plan to own your own, this is a must-have. Even if you know how to swim, it can be easy to underestimate nature. On the sunniest, calmest days out on the Potomac River, I often forget that it actually has a pretty powerful undercurrent. An inflatable PFD is a good option for flat water in the summer, but invest in a wearable one for ocean or surf SUP, white water SUP, or winter paddling. The last thing you want to worry about if you fall into freezing water is how to inflate your life jacket. Ankle leash: An ankle leash is also important to have if you fall or jump off your board a lot so it stays within range at all times and doesn’t float downstream. Most boards come with them, especially rentals, but definitely make sure your own board has an ankle leash to protect your investment. Dry bag: This is a must-have if you plan to stay out on your board for a long time. A durable dry bag can keep an extra set of clothes, snacks, and even your smart phone dry if it falls in water or gets splashed. Electronics dry bag: Even if you purchase a standard dry bag, it’s probably a good idea to have a backup case for your smart phone or iPod in case it rains or you happen to fall off when your dry bag is open. Key floats: Somewhere in the Potomac River are the following items of mine: a pair of sunglasses, my credit card, a bottle of water, a tank top, and a Garmin Vivofit that somehow unlocked and popped off my wrist never to be seen again. Key floats help ensure your things don’t sink to the bottom. 3. You get to try something new. You may not want to admit it, but I will: I get tired of running all the time. Especially when I get stuck in a rut or I get injured. And once you meet a running goal, you might experience a sense of not know what to do next. Try paddle-boarding! 4. 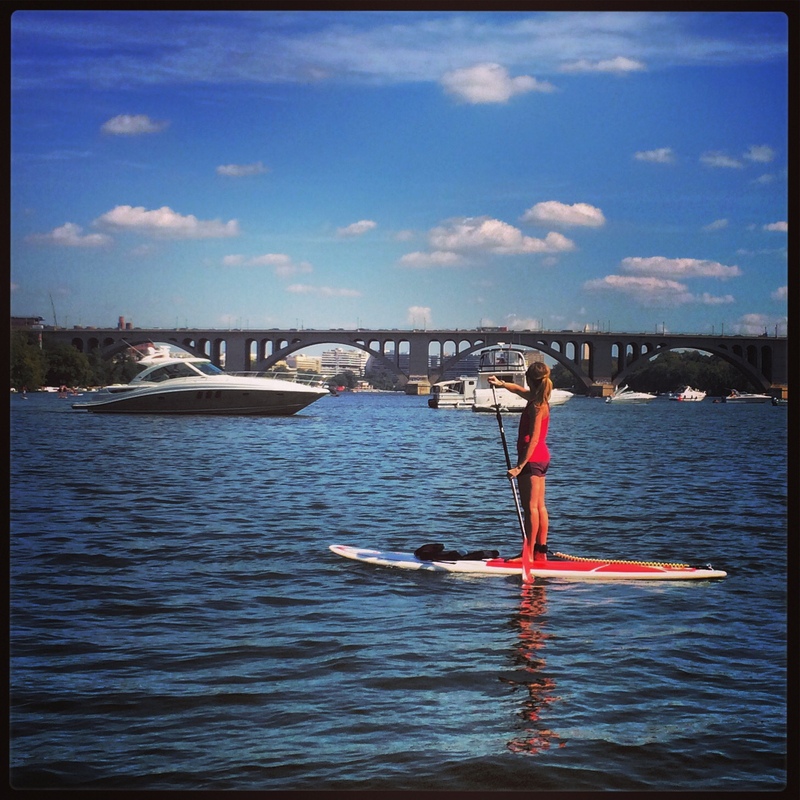 No matter where you live, there’s a paddle-boarding location nearby. North Dakota: Paddle On (Bismarck), Boathouse on the Red (Grand Forks), North Dakota Tourism with a list of all the bodies of water you can paddle along, and there are a LOT! Most of the places I listed above are places where you can rent a board, take lessons, or buy a board. However, if you try it and love it immediately like I did and you live close enough to one of these locations to make a board purchase worthwhile, do it. 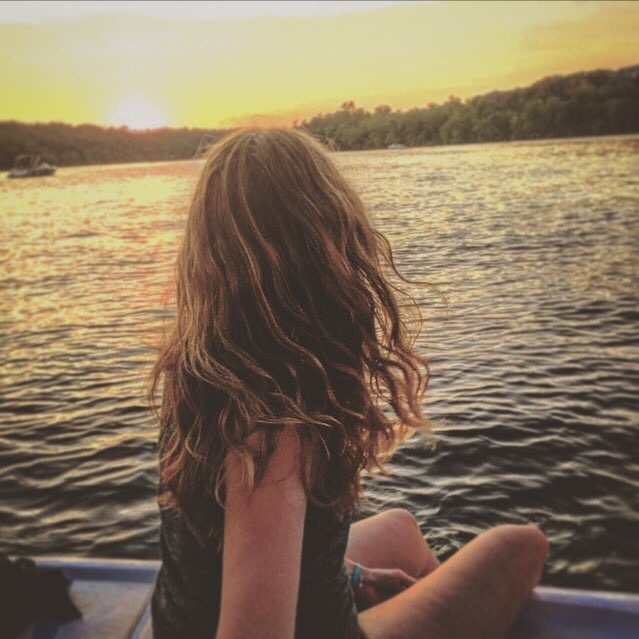 Check with the state tourism board or local governing entity to make sure you’re not breaking any laws and have any necessary boating permits. Fear not, my fellow Midwesterners, SUP is still within your reach! 5. There are races in SUP, too. Want to take your competitive badass to another level? Try a SUP race. This is on my goal list for next year. A simple Google search is sure to yield some results. 6. It’s another great way to connect to the natural world. One of the things I love most about running is that you get to be outside. Even in the harshest conditions, there is something that makes you feel alive about being part of nature. If you are lucky enough, you can get that feeling out of SUP, too. There’s almost nothing better to me, some days, than a paddle up the Potomac River away from DC after a long day at the office. It’s quiet, peaceful, and I’m usually the only one out there. Some people pay for that kind of serenity. I’m out on the water at least 3-5 times a week in the summer time, but I’m not always paddling. Sometimes I sit out on the board for hours, watching other paddlers, boaters, and just enjoying the sun and water. It’s a great place to do the same kind of thinking you do on running trails. Running builds us up as much as it breaks us down, and we all know it. Sooner or later, we hear the things we don’t want to hear anymore: that our knees are shot, our bodies need rest, our hearts are working overtime. 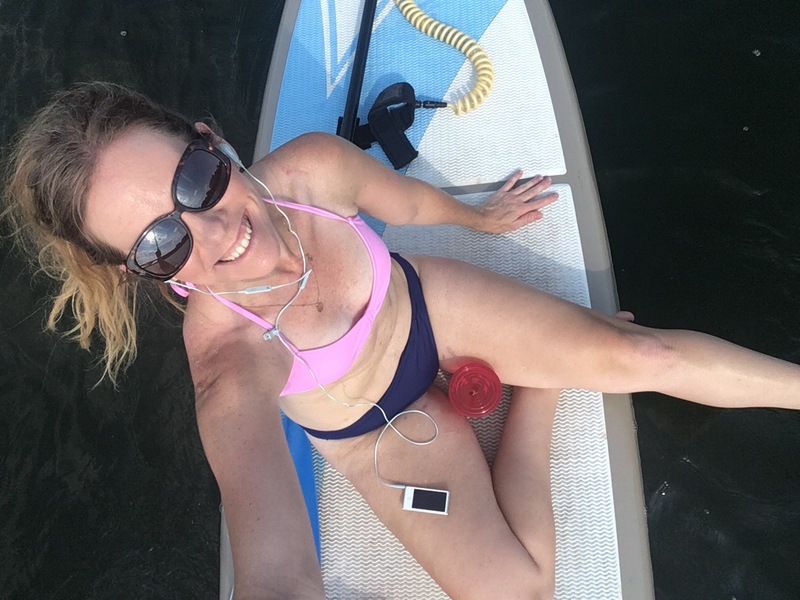 I never want to hear those words from my doctors, but it’s good to know that, if the day comes when I can no longer run, I have something else that brings me as much joy in paddle-boarding. And I’m guessing that the likelihood of my doctor telling me, “Sorry, Sara, you paddle-boarding days are over,” are slim. Paddle sports are low-impact, strength-building, cardio-enhancing activities and you are never to old to get out there. It’s a sport for all ages. I hope I have convinced you to at least give paddle-boarding a shot next summer. If you are in the DC area, be sure to visit the folks at Boating in DC for at least the next couple of weeks when the boathouse is open! A big thank you to all of the staff there who have gotten me out on the water these past two summers. I’ve had the time of my life with you all. Hope to see you out on the water very soon. I love this! And FloYo is challenging but great – you just can’t worry about failing in! I’ve been seeing the term “SUP” for a few years, but I never knew what it stood for! LOL. This sounds like a fun change of pace, and I didn’t realize they offered it so close to home. Loved your post! 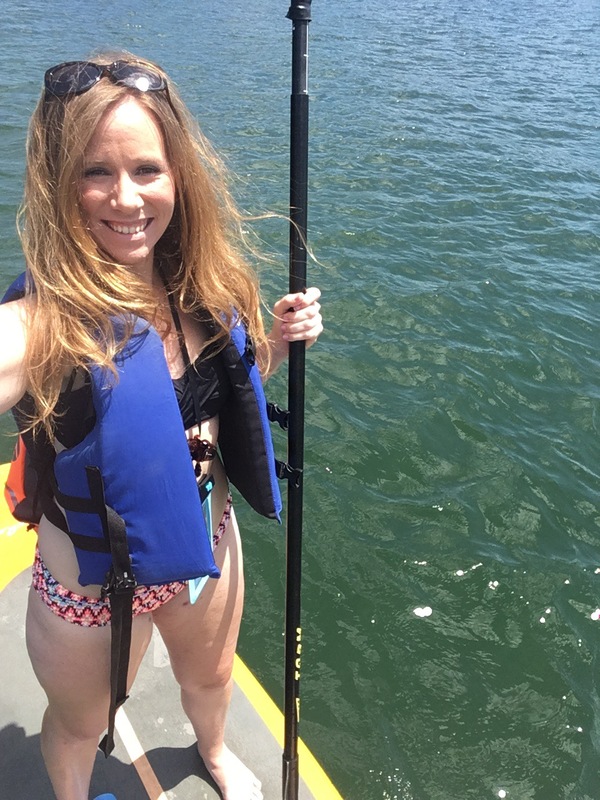 I started paddle boarding this summer and I’m hooked. Let me know if you’re ever in KC, I’ll take you boarding. Thanks! It’s so much fun, right?